Top Solutions Accepted from the Community AMA! 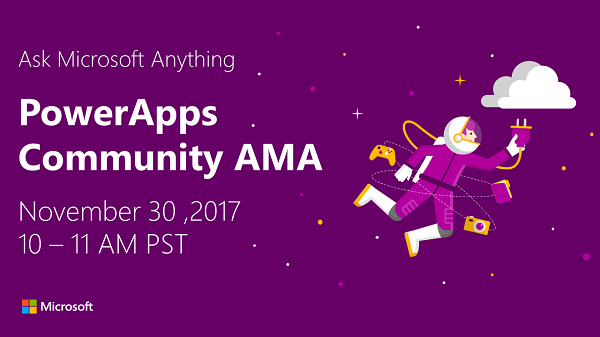 At the end of November, the PowerApps Team hosted its second Ask Microsoft Anything community event. During the Q&A hour, responses by the PowerApps team and the community members produced over a dozen accepted solutions. To celebrate, we've shared the top solutions below. To view more solutions, visit the AMA discussion board in the PowerApps Community! Missed the event? Keep an eye out for the next AMA event and get your answer live! I'm still unsure of when/if PowerApps can work offline. Is there a place that documents which data sources connectors support save\load data? What is your favorite part about the PowerApps Community? Is there any update regarding the availability of the PowerApps web part for SharePoint Online that was mentioned at Ignite? Is it still expected this year? Is there a way to find out the size (in bytes) of a screen or the whole app? Have questions about getting engaged with the PowerApps Community? Reach out to me! Message me on the community (@mackenzie_lyng), connect with me on Twitter, or email me directly! See you in the Community!